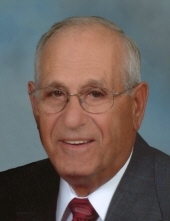 Nicholas "Nick" J. DiGregorio, 88, of Mason City, died Thursday, March 28, 2019 at Good Shepherd Health Center in Mason City surrounded by family. A Funeral Mass will be held 10:30 A.M, Tuesday, April 2, 2019 at Epiphany Parish - St. Joseph Catholic Church, 302 5th St SE, Mason City with Rev. Kenneth Gehling officiating. Burial will be at Elmwood – St. Joseph Cemetery in Mason City. Military rites will be conducted by the Mason City Veterans Association. Visitation will be held from 4 to 7 P.M., Monday at Major Erickson Funeral Home, 111 N. Pennsylvania Ave, Mason City with a Scriptural wake service at 6:30 P.M.
Memorials may be directed to Epiphany Parish or MercyOne Hospice. Nicholas John DiGregorio, the son of Anthony and Annunizata (Puccella) DiGregorio, was born August 21, 1930 in Mason City. He attended and then graduated from Holy Family High School in 1949. Nick served his country as a corporal in the U.S. Army during the Korean War from June 6, 1951 to June 6, 1953. Upon his honorable discharge, he returned home to Mason City. On September 24, 1955, he married Dorothy Pontenberg at St. Joseph Catholic Church in Mason City. They lived all of their married life in Mason City where they raised their four children, Toni, Jay, Jeff and Tara. Nick was employed at Lehigh Portland Cement Company as a machinist until his retirement in 1992. He was always willing to help others and could fix anything. Nick loved bowling, fishing and golfing. He was very proud of his family and grandchildren. He was a member of Epiphany Parish – St. Joseph Catholic Church and the Knights of Columbus. Nick is survived by his wife of 63 years, Dorothy, of Mason City; four children, Toni (Bob) Erickson of Mason City, Jay DiGregorio (Mariella Gomez) of Ft Lauderdale, FL, Jeff DiGregorio of St. Paul, MN and Tara (Charlie) Maxwell of Eden Prairie, MN; 10 grandchildren, Kathi DiGregorio (fiancé, T.K. Pandian), Michelle (John) Samson, Lauren (Barrett) Lahm, Teresa DiGregorio, Ryan Erickson, Nick DiGregorio (fiancé, Breanna Carroll), Jack DiGregorio, and Cole, Bennett and Grace Maxwell. He is also survived by special family friend, Cari Wittman, along with many nieces and nephews. He was preceded in death by his parents; two sisters, Yolanda and Loretta; and two brothers, Parry and Nicolo. To send flowers or a remembrance gift to the family of Nicholas J. DiGregorio, please visit our Tribute Store. "Email Address" would like to share the life celebration of Nicholas J. DiGregorio. Click on the "link" to go to share a favorite memory or leave a condolence message for the family.